My oldest went back to school after winter break today. Having school starting again on a Thursday is throwing off my whole schedule. I woke-up this morning sure that it was Monday, luckily by the time my son was at the bus stop I remembered that it was only a two-day school week. I think that my age is starting to show with my lack of memory skills (I'm not discussing what birthday I am celebrating this year, lets just say that I will be halfway between 30 and 40). Since my kids have both been home this week I have been making my dinner meals easy and child friendly. Earlier in the week I made a new recipe for Pork Carnitas with Garlic and Orange from the November 2012 issue of Food and Wine magazine. This recipe has 8 ingredients. It takes 4 hours 45 minutes of total time, 45 minutes of which is active and makes 4 to 6 servings. I did have to make a few modifications to the recipe. The pork shoulder that I was able to find didn't have a large layer of fat. Due to this fact I had to add a small amount of stock to keep the pork moist in the oven. This also helped to keep the jalapenos from drying out. It was additionally helpful in making the pan sauce to add to the pulled pork at the end of the recipe. I served the carnitas with avocado and cilantro as suggested by the magazine photo. I followed the remainder of the recipe as written. Be careful to watch the jalapenos in order that they don't burn. Since my pork shoulder was lower in fat it was necessary to add the stock in order that the jalapenos did not burn. I would suggest following this step if you have the same problem. The roasted garlic was my favorite part of this recipe. It lent a delicious flavor to the pulled pork. 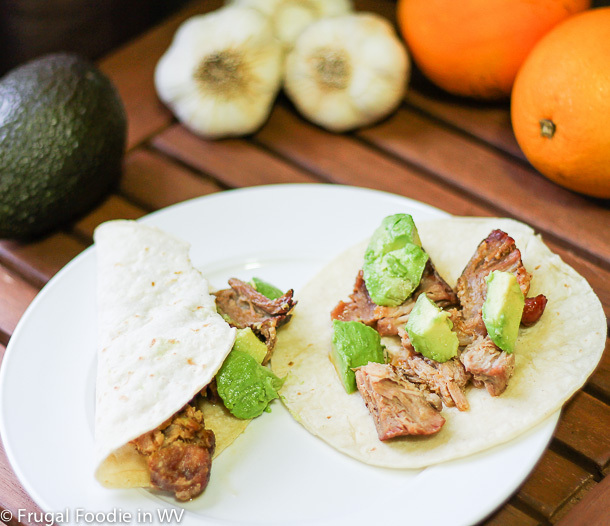 For the recipe go to Pork Carnitas with Garlic and Orange. I don't eat pork but I bet the dish would work with any meat. I know what you mean about school starting back today! I could not get with the program! These look yummy. Thanks for sharing. Glad that I'm not alone :) They really are yummy and make a ton of leftovers! Roasted garlic is one of my favorite flavors too! Great tip about adding the stock; I don't know that I would have thought of that. I love roasted garlic, it is so yummy :) The stock really does make a difference for keeping the pork moist. Have never heard of carnitas before! The garlic and orange had me hooked. Always looking for new food ideas. Will definitely give this one a try, but will switch out pork with vegetarian beef tips! I switch out meats all the time :) Especially chicken for beef etc. It works great! This looks like a wonderful dish! I wish I had more time to cook. Work seems to get in the way of making nice meals like this one. Thanks :) I am lucky that since I stay at home I am able to make longer meals during the week. I make shorter meals on the weekend since we are normally busy. Stopping by from the blog hop...yum! Those look delicious! My husband and I cook mexican food all of the time. Carnitas are delicious. I will have to try your recipe!! We cook a lot of Mexican food also :) Come back again soon! This sounds fantastic, actually. I never would have thought that garlic and orange would have mixed well together. I was skeptical of the orange and garlic together also, but it turned out really well! Looks yummy!~New follower from Weekend Social Mix Blog Hop. With the time off last week and this week, my schedule is all thrown off right now too. Hopefully after this weekend I'll get back on track. This looks so yummy! I just picked up some corn tortillas. We have already done fish tacos and shrimp tostadas. This would be another perfect recipe. Thanks for sharing! Hey stopping by from the blog hop to follow. So glad I did, this recipe looks so good. I'm going to try it this week. Thanks for the follow and sweet comment :) Going over to check out your blog now. If you try the recipe tell me how it turns out, I love hearing from readers! It looks awesome! I think it would take me more than 45 min. prep time. Our kids have a longer holiday in S.A. as it is their summer break. In winter (June/July) they have only three weeks off. This year we'll be in the States visiting family in FL, so we'll have to take time off from their schools to extend their holiday to make the trip worth it. Thanks for linking on Amanda's Books and More! I made some like these a while ago and get stop thinking about 'em!! Yum! i love the orange! Thanks for sharing at Foodtastic Friday!